Virtual Network Computing (VNC) is a desktop sharing system that can display the screen of one computer (Server) on the screen of another (Viewer). Based on Remote frame buffer (RFB) protocol it allows mouse and keyboard to control the server computer remotely. 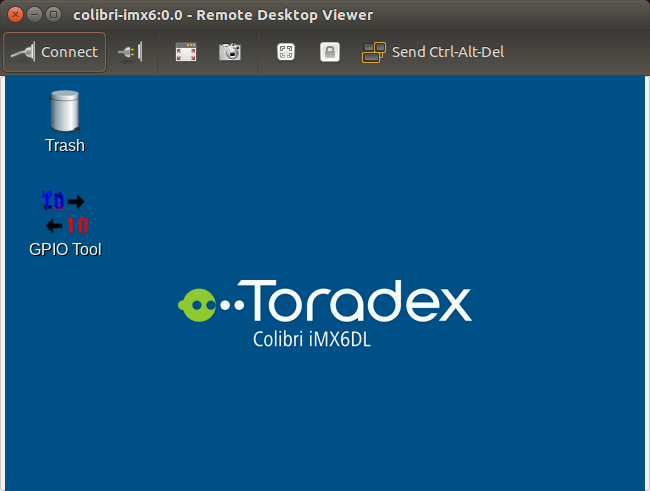 A VNC server does not come installed in the Toradex pre-built images. You can add support by building a custom image from OpenEmbedded. For instructions on how to build an OpenEmbedded image, see OpenEmbedded (core). There are some VNC clients available for Linux. Vinagre, that comes pre-installed in Ubuntu, will be used as example.